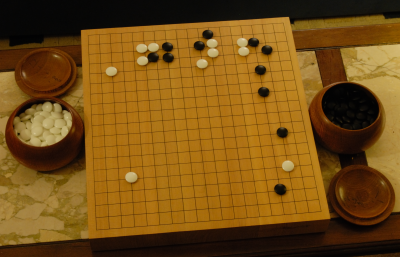 The game of go combines simplicity of it's rules and aesthetics, with a range of variation and posibility unmatched in any other game. It is an ancient game that originated in China here between 2500 and 4000 years ago. Until IE 7.0.5730.11 Microsoft has failed to support CSS 2.0 sufficient to render this site. If you scroll down all content is available, but it looks better with a CSS 2.0 compliant browser. Upgraded and still seeing this message? Go is simple, but my opponents keep being difficult. 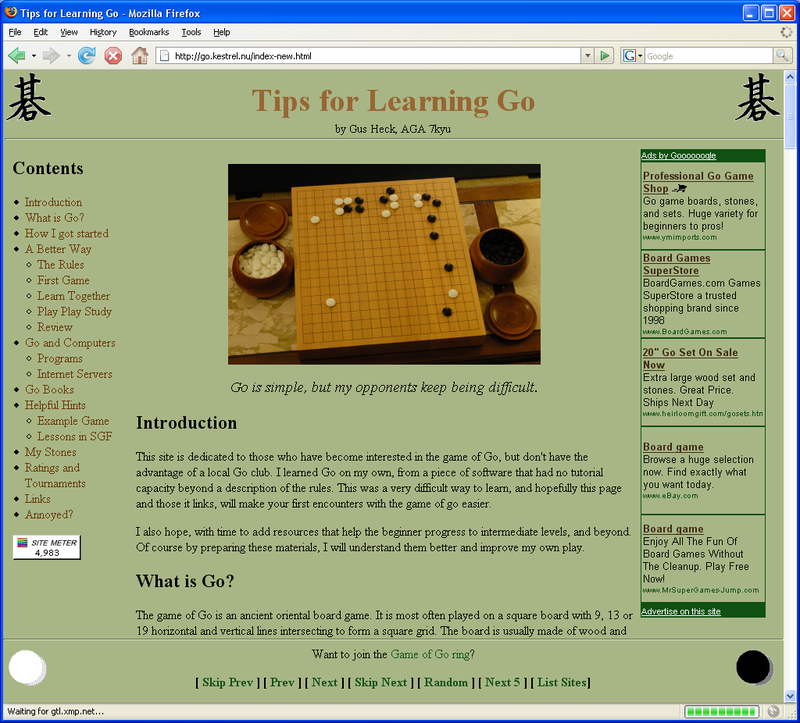 This site is dedicated to those who have become interested in the game of Go (also known as Baduk or Wei Qi), but don't have the advantage of a local Go club. I learned Go on my own, from a piece of software that had no tutorial capacity beyond a description of the rules. This was a very difficult way to learn, and hopefully this page and those it links, will make your first encounters with the game of go easier. I also hope, with time to add resources that help the beginner progress to intermediate levels, and beyond. Of course by preparing these materials, I will understand them better and improve my own play. Fun Fact: the video game company Atari is probably named based on Go! Improved the header with a photo I took in the Nihon-Kiin, and fixed flash players to not over-run the headers and footers. New Tournament Results! I took 1st place in the MGA Spring Handicap (yeay!). Congress Results! I won two tournaments! If you are using one of the recommended browsers and can still see this, then you need to change the preference labeled "Identify as" This setting allows you to lie to poorly configured web servers about what type of browser you have so you can view their pages. Right now you are telling the world you are MSIE when you are better than that! Some sites may not realize your browser is better... email them!